Last week marked a number of important milestones towards Scotland becoming a fairer country – which is a key objective of the SNP Scottish Government. One of those milestones was the publication of our Fair Work Action Plan. The SNP wants to make Scotland be the best country in which to live, work, invest and do business. At the heart of this ambition lies our commitment to fair work. For employees fair work means decent wages, secure contracts and just working practices. Fair work is not only right in principle, it also results in better health and greater wellbeing for workers. In turn this drives creativity, innovation and productivity. It also reduces staff turnover, which means increased profitability for businesses. With employment reserved to Westminster, Scotland does not yet have the powers to make fair work a legal requirement, but that doesn’t stop us from taking as much action as we can to encourage fair work practices. For years the Scottish Government has championed good employment practices through schemes such as the Scottish Business Pledge and Living Wage accreditation, and we are now strides ahead of the rest of the UK in many areas. There are now 1,300 accredited Living Wage Employers in Scotland. We also have a higher proportion of employees paid at least the real living wage than any other UK nation. We have gone further than any other part of the UK to help eradicate blacklisting from public contracts, and we have ensured that no person directly employed by the Scottish Government is on an exploitative zero hours contract. 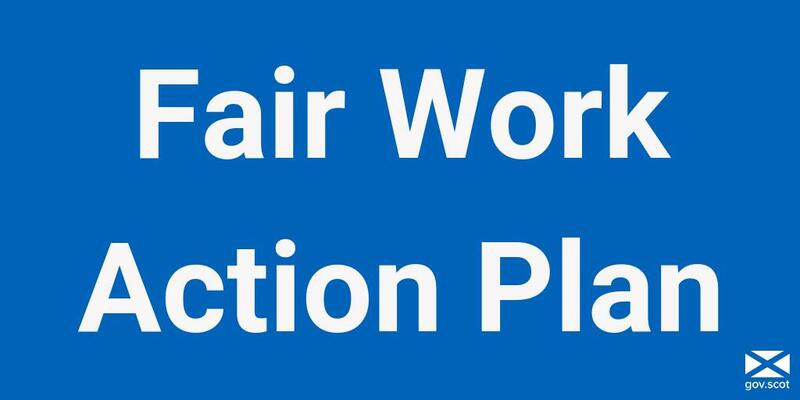 It’s great progress and we want to do even more to support workers and businesses across the country, which is why we have been working with the Fair Work Convention and the Scottish Trades Union Congress on the Fair Work Action Plan. The plan sets out a range of new measures to embed good practice, with tailored approaches to meet the needs of individual businesses. It includes setting up a new Fair Work service for small and micro employers, a new target of increasing the number of employees paid the real living wage by 25,000 over the next 3 years, a revamp of the Scottish Business Pledge to fully align it with fair work practices, and a learning network to better support businesses who want to sign up and meet these objectives. We’re working hand in hand with unions and employers to put fair work first in a truly meaningful way. This is an approach that is good for workers, good for businesses and good for Scotland as a whole, and that is why we’re so determined to lead by example. Ultimately, for as long as employment law is reserved to Westminster the Scottish Government’s ability to eradicate unfair working practices will be limited, but that won’t stop us acting where we can. Another area which remains substantially reserved to Westminster, but where some new powers are nevertheless allowing us to take a dramatically different approach to the rest of the UK is social security. Since the Social Security Act was passed by the Scottish Parliament last year, we have been able to improve the lives of thousands of people across the whole of Scotland. We have delivered the Carers’ Allowance Supplement, paying out over £33 million to over 77,000 carers. We’ve also put £2.7 million into the pockets of over 7,000 families in Scotland through the new Best Start Grant. In fact since our new agency, Social Security Scotland, first opened its doors, we have paid out an additional £35 million to people across the country. That is already making a real difference – but there is so much more to come. This year there will be four new benefits to help carers and low income families, and we have now announced that we will take responsibility for the rest of the devolved benefits from next April. From there we will roll out disability and carers benefits, and winter weather payments. Having these powers is good for the Scottish Parliament but it will be truly transformational for the people in Scotland who for too long have felt the failures of the UK Government’s callous approach to benefits. Having these powers means that we are able to build a dignified, respectful social security system, with benefits co-designed with the people of Scotland. These powers have broken new ground and by the end of the process – which takes time because of the complexities involved and the need to get it right – we will have accomplished the most complicated extension of devolution since the Parliament was reconvened twenty years ago. It shows how Scotland can choose a different path and create a more equal and prosperous country, with fairness at its core. Imagine what more we could do if we held the full range of powers of independent Parliaments.